Discussion in 'Chicken Hatching Eggs' started by Yashar, Mar 26, 2012. PM me to let me know what you want and when you want it. # 4 - *Black Quechua Olmec I highly recommend hatching these under a hen. In short, the three with asterisks are are on the wild side having a higher percentage of Jungle Fowl Genes. All except the Colloncas are quite rare. I'll go into more detail about each breed further down. Huastec, Black Quechua Olmec, Sweet Potato Quechua, and Colloncas are the most winter hearty. I didn't use heat at all this last winter and everyone from all of these groups did fine. The Huastec is one of the rareest breeds in the world. It's an ancient black-boned fowl from southern Mexico and Ecuador. The Huastec produces lots of medium to large eggs, is calm, confiding, personable and fairly quiet. Whereas the breeds of some roosters, like the Leghorn, tend to fiercely exclude other roosters from access to hens and shelter, the Huastec is a cooperative breeder. They can be run in braces; three to five roosters to accompany a little bevy of hens. Each rooster has a favorite hen and vise versa.The Huastec is incredibly cold hardy and make wonderful parents. The roosters are just as attentive to the chicks as the hens. The Saudeleur is a Micronesian Gamefowl descended of the Violaceous Junglefowl (Gallus violacea Gould) and Austronesian Fighting Game. The Saudeleur is a wild race, completely naturalized as a feral bird in the interior of the mysterious island of Ponape (Pohnpei). Trapped by the islanders for their beautiful plumage , they are amongst most prized possessions in Micronesian villages on the coasts. 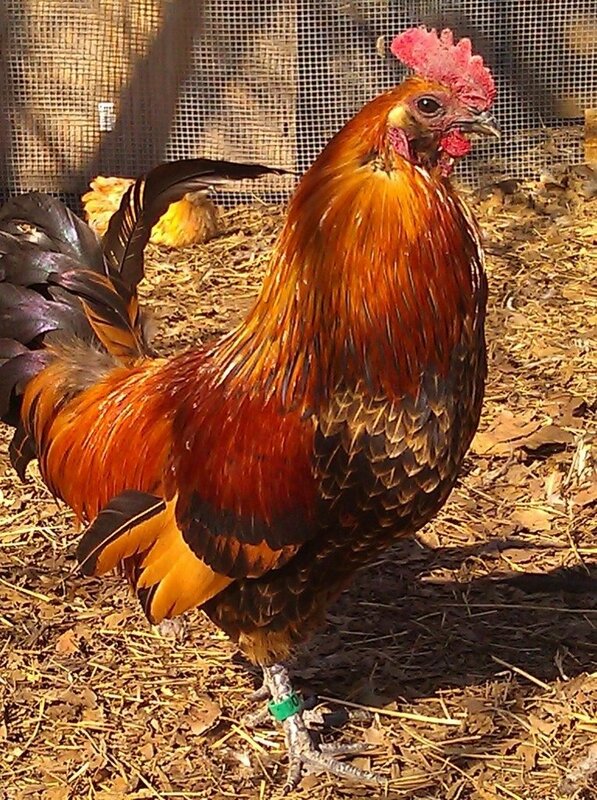 This is an unusually graceful, light-weight breed, more junglefowl than chicken. The crow is pleasant and multi syllabic but the birds are not particularly vocal. This is an antique South American relative of the North American Ameraucana. Our strains have Marquesas Island Junglefowl (Gallus temmincki Gould) ancestry as well as old Peruvian Indian village hen genetics. Colloncas are one of the original and most ancient breeds of the Mapuche Indian culture of Chile. They produce generous numbers of colourful eggs and like many South American fowl lay well into the winter. Some hens will produce a pale sea foam hued egg, others robin blue, ash grey and even lilac. A single pair of Colloncas may produce hens that each lay a different colour. [FONT=Book Antiqua, serif]Colloncas are best known for innate tameness. They enjoy being held but unlike Silky fowl, which also enjoy human companionship, the Colloncas is completely winter hardy and can evade predators ably. It is a fairly strong flier and one of the more quiet breeds. Colloncas are very good at tick and fly control and are traditionally kept with sheep and llamas. Please PM me if you want to arrange a purchase (or have questions). I just want to thank you for offering these eggs to BYC! Beautiful birds. I can not wait for my eggs. Great pics, Yashar! Mine are suddenly laying to the point I can't keep up, and the incubators are all full. I suppose I'll be putting mine up soon. Here are some pics so folks can get an idea of more of the looks. I'll let Resolution pop on here and name them. Sorry about the cruddy camera quality. My phone was confused about the light correction. Wow, ChooksChick, great pictures. What breed is that rooster with the amazing breast feathers that look like scales? I like his purplish tail. Can I ask a novice question? Will the Colloncas mate with Araucana successfully? Well, If both the birds are rumples, you may want to trim the feathers around the vent of both hen and roosters you're breeding. Since they don't have the last vertebrae (or tail), they can't move the feathers out of the way the way they a tailed one would. So the contact could be hindered. That is the only issue, which is the same weather with a Collonca or an Aracauna. Yashar, I got the eggs today & they look great, pretty colors & thanks for the extras! Keep me posted on how the hatch goes.